When you first launch SuperSync, SuperSync loads a 'Local Library'. This library is what will be used as a source and destination for tracks when Syncing. The Local Library is essential 'your library' and is typically located on your computer or on a hard drive connected to your computer. If SuperSync didn't find your iTunes library, or if you use another music player, you can follow the instructions below to import your music manually. To configure your Local Library, go to SuperSync's LOCAL menu and select the Configure Local Library command. The Configure Local Library will open. The Use my iTunes Music Library (recommended) option connects to iTunes and uses its library. The Read Media Files From Mass Storage option uses folder/directory on any hard drive (e.g. a folder on your desktop or one on a USB connected hard drive) for the Local Library. When using this option, iTunes syncing features such as meta data (play counts, ratings, etc) are not enabled. Selecting the Next button will take you to a screen where you can specify the folder you want to use. The New Music Library On Hard Drive uses an empty folder for your Local Library. The purpose of this option is to use a completely blank library that will receive tracks from a remote library for backup/mirroring purposes. When using this option, iTunes syncing features such as meta data (play counts, ratings, etc) are not enabled. Selecting the Next button will take you to a screen where you can specify the folder you want to use. 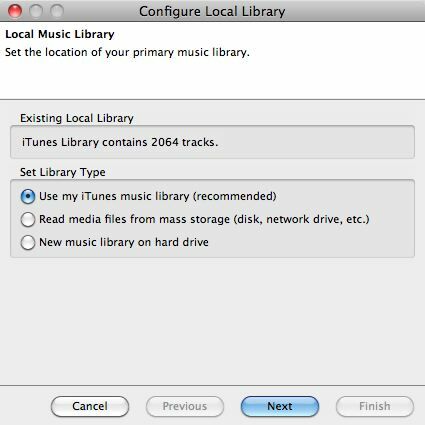 Important Note: For maximum integration with iTunes, set your local library to import and synchronize with iTunes.